Following the plans outlined by South Gloucestershire Council to change the designation of land adjacent to the Link Road, including the skater bowl and a large chunk of the Community Garden, from protected green space to be earmarked for potential future work, has caused a reaction in the Filton community. With publicity of the issue and petitions well on their way to reaching the goal of having the plan challenged at a South Gloucestershire council meeting, the details in this plan will be explained, as well as what the commnity can do if they want to help. What is the Policies, Sites and Places Plan? The Policies, Sites and Places Plan (PSP) is a county-wide proposal by South Gloucestershire Council to designate and re designate areas that are to be considered “green space”. These areas classified as “green space” will essentially have protection from future plans to build upon the areas, whether that be roads or housing. However, as part of this, areas that are considered central community hubs haven’t been granted this classification, leaving large areas of the Community Garden and key social hubs like the skate park vulnerable to potential future expansion of the Link Road. Whilst the potential widening of the Link Road would be subject to further consultation, the initial PSP plan would support any future development suggested. With this in mind, Filton Town Council feel they weren’t effectively informed about the PSP, both as a council and landowners. 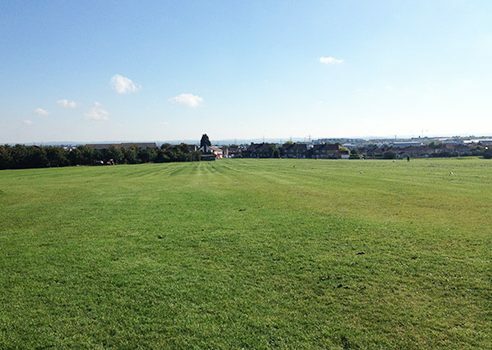 However, with the help of local residents and local publications such as the article in the Filton Voice, a petiton to challenge the area of this plan regarding Elm Park is well on its way to the required 2,500 signatures to be heard at a South Gloucestershire Council Meeting. You can sign the petition, either online here or at one of the various areas in Filton that hold paper copies, such as the Leisure Centre or Filton Library. Please only sign the petition once, as the online petition will be combined with the paper copies and duplicates will be removed. The first meeting of the Save Elm Park Group consisting of Councillors and residents was held on Tuesday 22 August 2017. Officers were elected and a timeline was discussed for presentation of the petition to South Gloucestershire Council. Since the meeting the timeline has become more clear as South Gloucestershire Council have confirmed the dates of Council meetings. We now intend to present the petition to South Gloucestershire’s Cabinet on 9 October 2017 which would give the Council sufficient time to put it on the agenda for the Full Council meeting on 8 November 2017. It is anticipated that the Inspector’s report will be available and will be discussed at the Cabinet meeting who will thereafter send it to the Full Council meeting on 8 November 2017 with their recommendations. Residents will be able to attend and present questions at the Cabinet meeting in the regular slot at the start at the meeting. However our main thrust will be at the Full Council meeting when we will have a longer time slot. Regarding the petition at the time of writing we have 2,600 signatures so have exceeded our target of 2,500, however we have recently learnt from South Gloucestershire Council that they will only accept signatures from residents or people who work in South Gloucestershire. We will inevitably have a number of signatures from Bristol residents given that we so close to the border and in respect of the online petition there will be signatures from across the country from people wanting to protect green space. With this is mind we have set a new target of 3,000 which will give us a good buffer should South Gloucestershire choose to exclude some signatures. We are trying to make sure we get valid signatures and have started door to door collections, if anyone can help with this please contact me. The voting return slip is once again enclosed in this edition of the Voice, please use it if you are able and return to the Council offices. Filton and Bradley Stoke MP Jack Lopresti visited the Community Garden on Tuesday 29 August he was very supportive and vowed to do all in his power to stop the change of designation and any future development of the strip of land. If you need any clarification or have any suggestions or you feel you can assist in any way please do not hesitate in contacting me. Dave Mikkelson, Chair, Save Elm Park Group Tel 07766151756.